For 80 years, Cain Park in Cleveland Heights has entertained audiences under the stars with quality theatre, nationally-known musical and comedy acts, and arts showcases. Bob Hope, Harry Belafonte, Sarah McLachlan, Livingston Taylor, and Bela Fleck and the Flecktones are just some of the famous names that have graced the Evans Amphitheater stage, while theater productions like The Toxic Avenger, Hair, and Bat Boy The Musical have attracted sold-out crowds. Renowned actors like Hal Holbrook, Dom DeLuise, Carol Kane, Jack Weston, and Pernell Roberts have also performed over the park’s history on sets designed by industrial artist and Cleveland native Viktor Schreckengost. And then there's the yearly Cain Park Arts Festival, a three-day juried art event held each July drawing as many as 150 local and national artists, selling their work at every price point. “Cain Park is a touchstone for so many people," says Kara O’Donnell, a city planner and historic preservationist for Cleveland Heights. "Those who grew up here and those who have since moved far away retell stories detailing their time performing, working behind the scenes, attending summer camp, lifeguarding at the kiddie pool, meeting their spouse, racing down the sledding hill and so on. From the moment Cleveland Heights voters approved a $100,000 bond to acquire a 22-acre ravine for park use in the heart of the city in 1915, residents knew that land was destined to be a special place. Voters approved another $75,000 bond in 1925 for improvements to the land. By 1938, Cain Park began to emerge as an outdoor theatrical venue, thanks to the efforts of Cleveland Heights mayor Frank Cain and Cleveland Heights High School drama teacher Dr. Dina Rees “Doc” Evans. Evans’ theory paid off, both amongst her high school students and the community. In 1938—at the bottom of what is today the sledding hill—Evans produced A Midsummer’s Night Dream and hastily called the location Cain Park. Mayor Cain did not object, and the name stuck. “Everyone thought it was so fun and so wonderful,” says Roshchakovsky. “So, they decided to build an amphitheater. J.D. Rockefeller donated trees, and the WPA and Soldiers and Sailors Relief Fund provided the labor. On August 10, 1938, Cain Park was officially dedicated with the production of Warrior’s Husband." The park originally put on summer stock theatre—10 shows a season—and the Colonnade and Terrace were constructed slowly, due to World War II, but were finally completed in 1945. The Alma Theater (named after mayor Cain’s wife) was built in 1944 as a children’s’ puppet theater, and Doc Evans served as theatrical director until 1950. The theatre program changed direction over the years, with the Cain Park Teen Theater thriving in the 60s, and the amphitheater sitting dark through much of the 70s. Cain Park got a boost in 1978 when Cain Park alumnus David Shaber chose to film his movie, "Those Lips, Those Eyes" on the grounds. The film created a renewed public interest in the park, prompting new stagings of musical productions, concerts, and dancing. There were stories of sets blowing over during windy performances, flooded orchestra pits, and other weather-related issues. Roshchakovsky recalls a time when Arlo Guthrie’s performance was delayed repeatedly because of tornado watches, and when “everything was cancelled” during the 2003 blackout. Cleveland Heights residents voted in 1987 for a $5 million bond to give the park a facelift, which is the look of the park today. The brick towers that were part of the original theater were the only components left intact following the last renovation; rumor has it that the bricks used in the construction of the towers were salvaged from razed mansions around town. The amphitheater got a roof, and a new entrance to the Alma Theater was created, along with improved ventilation, more comfortable seating in both theaters, and brick courtyards in front of each theater. Roshchakovsky says that when Sarah McLachlan was announced, the concert sold out in two days. “She was at the height of her career and wanted to spend time driving around the park in the courtesy vehicle with the operations staff before the concert,” she recalls. 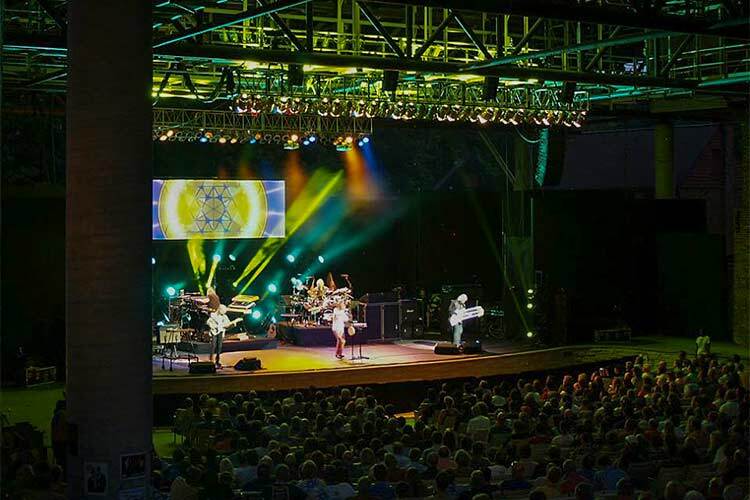 The 2018 season begins this Thursday, June 14, with Memphis The Musical, and The Monkees will kick off the concerts on Saturday, June 16. The Cain Park Arts Festival runs Friday, July 13, through Sunday, July 15. The Cain Park Ticket Office is now open.